DIY, behind-the-scenes, and everything in between. We’re certain putting an elf inside a balloon was likely not at the top of your list of things to do for 2018—however this is such a fun way to present your elves, and it’s not actually too complicated to do. We’re here to show you step-by-step how to put your elf inside a balloon. Fold your elf in half. Don’t worry, it doesn’t have to be perfect. While your elf is folded in half, use both hands to carefully stretch the balloon neck and opening. Starting at the bottom folded portion of your elf, stretch the balloon over the elf. Slowly work your way up the body little by little, pulling the neck and opening of the balloon up around your folded elf. Now that your elf is completely encapsulated within the balloon, blow up the balloon and tie off the end. With your elf inside the inflated balloon, use the string included in your Elf Made Easy kit to tie on the “please help me” sign. Now the fun part…wait until your kids see this! Valentine's day is right around the corner. While we suspect many of you will be feverishly toting out your craft bins this weekend in order to make the perfect Valentines, we are taking the less-traditional route by avoiding candy and going to one of our FAVORITE hidden gems-----self inflating balloons. These awesome Valentines are super inexpensive, very unique, and take only a few seconds a piece to complete. Plus, we all know how much kiddos LOVE balloons. Can't go wrong with these! Okay, enough already......let's get started! Start by printing off your desired Valentines. We designed them in several colorways to give you as many options as possible. Next, use scissors or an X-acto knife to cut out each Valentine. Once you have them all cut out, gather your washi tape and all of your Whack-a-Pack balloons. Start pairing them up as you see fit. This is a great time to get creative and play with various colors and patterns. You can also go a step further and free your inner creative by adding glitter, sequins, feathers, anything that you heart desires. Carefully clip off the end of each balloon pack right below the package seal. The balloon pack will not work if the seal is broken, so it's a good idea to have an adult help with this part. Voila!!! How cute are these?! Last thing to do is to sign your name at the bottom of each and you're ready to gift them all away! Halloween is one of our most favorite holidays. It can be fun, spooky, or downright creepy. Today, we have the perfect Halloween Cupcake DIY that you can pull off with any skill level, and with as much or as little effort as you desire. Kid tested and giddily approved! Seriously, how stinking cute! Follow along to see how we made these spooky graveyard cupcakes. 12" Wooden skewers cut into thirds. First, spread out the icing so it resembles the texture of the ground. Doesn't have to be perfect! You just need a good base to put the "dirt" on. Next, crumble your chocolate cookies into dirt and sprinkle the dirt onto each cupcake. Separate the chocolate cookies from the creamy center. Discard the icing. Place just the cookies into a zip top bag. Use a rolling pin, or some good old fashioned kid-power to crush the cookies into a fine dirt. We thought leaving some larger cookie chunks gave the best effect. Push a skewer into the bottom of each tombstone, until it feels nice and sturdy. Doesn't have to be perfect! Even kids can complete this task. The most important point is that the skewer is in far enough to support the Marshmallow Peep Tombstone. Push each skewered tombstone down into the center of each cupcake. This is where you can get creative. Push them in off-centered, crooked, any way you think looks best! Now step back and admire your job well done! How adorable. We want to see your tombstone creations. Be sure to tag Fete Box on Instagram and Facebook so we can see your adorable cupcakes! 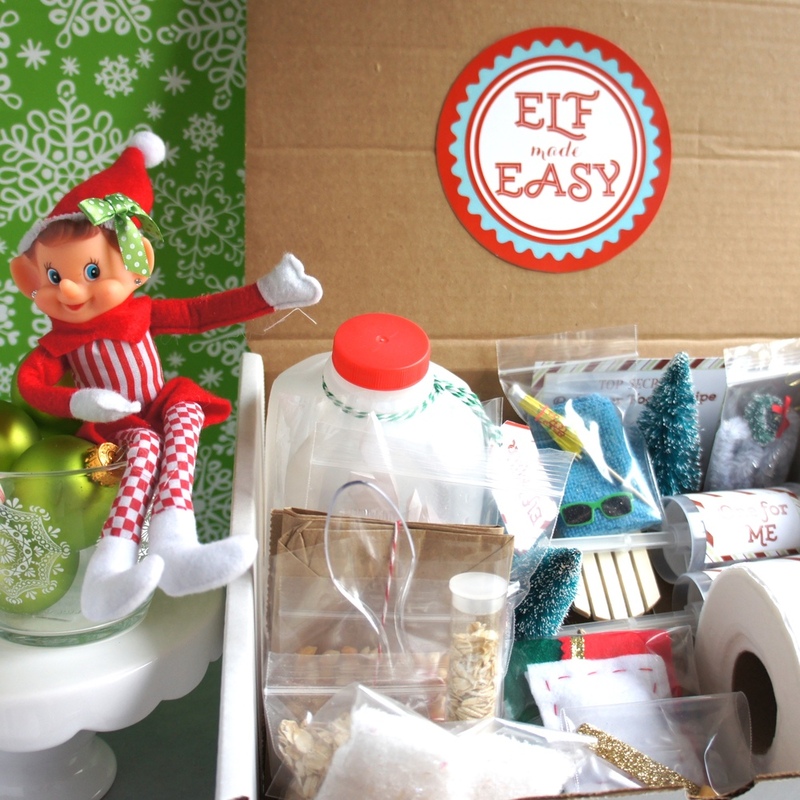 Anyways, today we wanted to pop by and answer some popular questions about our Elf Made Easy box. So, we'll attempt to keep this short and sweet using the Q & A format! What is Elf Made Easy? A parents/grandparents/teachers dream come true! Elf Made Easy is one tidy shipment of an entire month's worth of scenes and actions for your loving family holiday elf to perform each night. It takes ALL of the work and hustle out of the rascal holiday elf and allows you to enjoy the magic with your kids. How many scenes are included? What if I have more than one Elf, or what if I have more than one child? No worries at all! We try to make each scene as flexible as possible, since we understand everyone has a different situation at home. Some of the best uses of the Elf Made Easy box we've seen have come from families that put their own spin on the scenes. We highly encourage that! I'm not "crafty", can I still use this? Yes! That is the exact reason we created this box. Plus, their is a handy guidebook inside each box to guide you through the scenes. I ordered a Elf Made Easy box last year. Will this one be the same? No way. We've been busy brainstorming and searching out suppliers since early 2016. My kids are all different ages. How do I know they will all enjoy it? All ideas are tested on a real life kid, and we try to draw inspiration from as many pop-culture references as possible (that are kid friendly). We find that this ensures a super enjoyable experience for kids of all ages. How do I get the FREE bonus Elf Made Easy: Birthday Box? Easy peasy. Be one of the first 100 customers to pre-order your Elf Made Easy Fête Box by July 23, 2016. What is included in the Elf Made Easy: Birthday Box? When will the boxes ship? This is a pre-order event, so we will hang on to your box order until they ship in early November. We figured no one in their right mind would want to have to keep track of a holiday box for the nest 5+ months ;-) You're welcome! Free with purchase Elf Made Easy: Birthday Fête Boxes will ship shortly after the Elf Made Easy boxes ship. Will all the faux cakes and balloons be the exact same? No way. What fun would that be? We'll choose a variety of assortments and will pack them randomly. Fun! We'd love to answer any other questions you may have. Feel free to ask them below! And don't forget to pre-order your Elf Made Easy Fête Box before the free gift with purchase runs out!